Last week I reported about the response by our local Islamic extremists to the distribution of the DVD copies of “Obsession: Radical Islam’s War against the West” in dozens of major US daily newspapers on Sunday, September 14, including the Columbus Dispatch. Hatemongering organizations, like the Council on American-Islamic Relations (CAIR), have gone near catatonic with rage that anyone is challenging their control over the establishment media. Well, the second round of Obsession DVDs has begun hitting Ohio homes, as seen from the mailer above which arrived here yesterday. This very well may push extremists like CAIR over the edge. 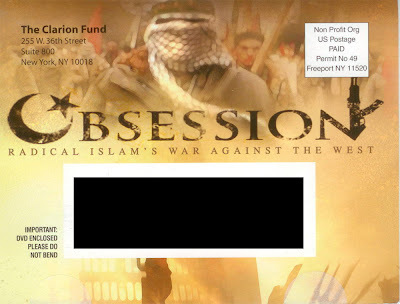 CAIR has already demanded an FEC investigation into the organization, the Clarion Fund, who is sponsoring the DVD distribution. And in Toledo, Muslim groups are in a state of near hysteria, claiming that they are living in fear because of the video drops. Thus, in a curious turn of events, CAIR is directly responsible for Islamophobia, telling Muslims that they need to be afraid. 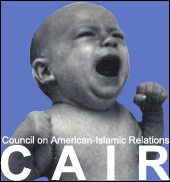 What is CAIR afraid of exactly? What the Clarion Fund has done is to take their message beyond the reach of Islamic extremists with their jackboot grip on the establishment media narrative, and reach out directly to American families to warn them about the immediate dangers of Islamic extremism. While the producers of Obsession go to great lengths to distinguish between mainstream Muslims and extremists, CAIR and its allies are attempting to erase that distinction between moderates and jihadists. CAIR’s malignant ideology has finally turned in on itself, and their reactionary response to the Obsession DVD drops is exposing the group’s true motives for all the world to see. When American families watch the Obsession video, and compare it to CAIR’s overheated rhetoric, the jig will be up. PS — look for my forthcoming review of the Clarion Fund’s next documentary, “The Third Jihad”, which is scheduled for release next month.